The Whiteboard Marker for the New Generation! 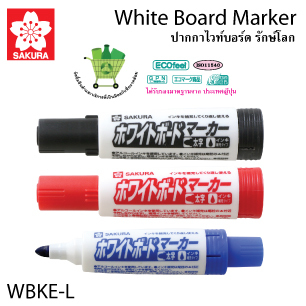 Made-in-Korea whiteboard marker that works on many surfaces including whiteboard and a plate of glass or mirror. With a choice of 3 bright ink colors, it delivers a outstandingly smooth writing. The ink is toxic-free, easy-to-dry but also easily erasable, without leaving any stains behind. The 5.5 mm tip of the marker which produces an even 2 mm line sustains heavy wear. Ink refillable, comes in 3 colors: Red, Blue and Black.